Today, September 30th 2011, would have been my grandmother's 78th year of life, if she hadn't left us so early. My mother, daughter and I celebrated her life tonight with her favorite dinner, pâté chinois. Pâté chinois is a French-Canadian dish similar to shepherd's pie and is pronounced "pate sinwa" (although she called it "pushanwah"). It is made from layered ground beef mixed with sautéed diced onions on the bottom layer, canned corn for the middle layer, and mashed potatoes on top. There are many variations but this simple recipe was the only way to make "pushanwah", according to Grammy. 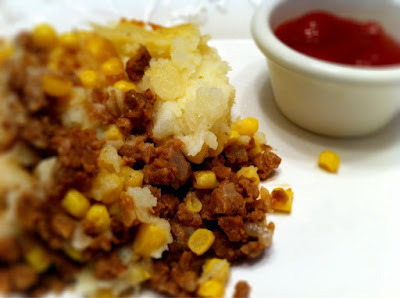 It should be obvious that only thing to do to make this vegan is use your favorite mashed potato recipe and vegan crumbles, like Boca. Traditionally served with ketchup, at least in my household. It's good ole' comfort food at it's finest. Happy Birthday, Loretta Mildred Potter!